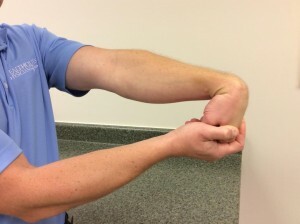 Tennis elbow or lateral epicondylitis is a condition that occurs due to inflammation of the extensor muscles and tendon on the outside of the elbow, where the muscles that extend your wrist and fingers attach. 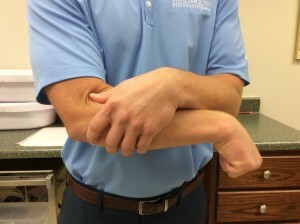 Typically, people will experience pain over the outer part of the elbow, which may or may not radiate to the forearm and can cause weakened grip strength. There are two main factors, which cause this condition to occur. 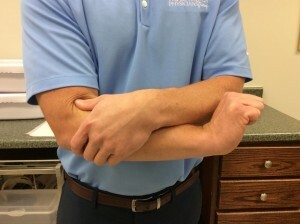 The first one is the inflammation of the extensor muscles themselves from overuse, and the second is the elbow joint mechanics are off a little bit, in particular caused by the radius (a bone in the forearm that lets you rotate your forearm) not moving correctly. This typically occurs with people who work with their hands a lot, such as mechanics, plumbers, painter, carpenters, and people who type all day. Sports can also attribute to the inflammation of those muscles, hence the name Tennis Elbow. 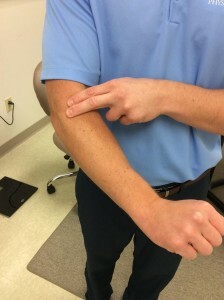 The following list of “3 At Home Stretches/Exercises for Tennis Elbow”, will demonstrate things you could do on your own to alleviate some of these symptoms. 1. Cross-Frictional Massage–place a couple fingers over where the muscles are tender and massage to your tolerance horizontally from front to back of your elbow. 3. Extensor Stretch–With your elbow straight, take the back side of your hand and place it flat on a table while trying to flex/bend the wrist as much as tolerable to stretch the tender muscle group. 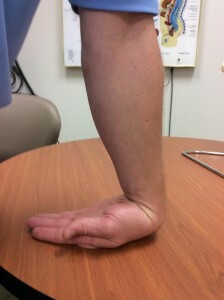 Another variation is to hold your arm out in front of you, with the elbow straight, and bend the wrist down to your tolerance in order to experience a good stretch. 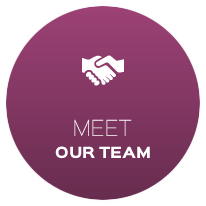 If you or someone you know is experiencing tennis elbow symptoms, we would invite you to stop by the office for an evaluation!